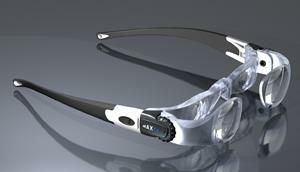 With flexible temples, the MAXTV telescopic glasses are the most comfortable television viewing device ever. - Eschenbach PXM® optics and flexible plastic temples allow for light weight (only 49 grams - or 1.7 ounces!) with an extremely comfortable fit! - Attractive, modern, hi-tech frame. - Protective, sturdy, zippered case included at no additional charge.